Matt Redman has made a name for himself over the last 22 years by writing some of the most well-known praise and worship music. His songs have been used by Hillsong United, Jeremy Camp, Matt Maher, Michael W. Smith, Rebecca St. James, Chris Tomlin, David Crowder, Kutless, Stellar Kart and many more. 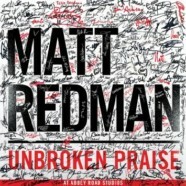 His latest collection, Unbroken Praise is sure to follow those lines and continue the impressive career Redman has had. Unbroken Praise is a strong title in itself. Praise and worship usually comes from a very broken place at times. When you’re broken and hurting, you come to God and give him everything you are. What we tend to forget sometimes, though is that we’re supposed to praise Him even when things are going well. Why not praise him when we’re unbroken as well? Songs like opener “Louder,” speak volumes and says it all- “we’ll never stop singing. We’ll lift our voices, make your praise so glorious.” From there Redman brings us “It Is Well With My Soul.” This isn’t a cover of the well-known classic hymn, though. While he utilizes the well-known chorus, he changes up the verses to original lyrics- much like many artists do with “Amazing Grace.” It shouldn’t be long until this one’s being sung all over the country in churches everywhere. “Flames” and the title track- “Unbroken Praise” are even more anthemic songs that are vintage Redman. While “Flames” is a more upbeat track that you’d hear at a Passion conference, “Unbroken Praise” shows Redman slowing it down exponentially and is perfect for sitting down, reflecting and playing in the background of your devotional time. Unbroken Praise is a record that, as always, shows Redman’s versatility. Redman never seems to fall short of expectations and continually writes worship songs that can be played at not only the huge Passion conferences but that also fit will at the smallest church services. With each album, Redman seems to top himself and put out music that’s continually stronger than the previous offering. Look for this to be a big album this year. By the end of 2015, Unbroken Praise should stand strong with Chris Tomlin’s Love Ran Red as one of the best records of the year.